It's A Chatham Tap Takeover Today! Sun King is taking over the taps at Chatham Tap Fishers today leading up to the release of this year’s batch of Zaius Oatmeal Stout. The Sun King beers on tap all day today are: Doppelbock, Oktoberfest, Sour Zaius, Pappy Van Muckle (Wee Muckle aged in Pappy Van Winkle barrels), Jungle Room Imperial IPA, and Nitro Cowbell Milk Porter (using nitrogen is a less carbonated, creamier style of delivery). Zaius will be tapped at 6 p.m. This is a great recipe for when you can’t sneak away to go camping. Pairs well with Osiris Pale Ale or another hoppy beer. In a mixing bowl combine BBQ sauce, beer, worcestershire sauce, & spices. Add the sausage and veggies to your BBQ sauce. Take a large piece of heavy-duty aluminum foil and fold into a pouch. Pour everything into the pouch and place on a medium hot grill over direct heat for about 25 minutes, turning half way though. Remove from grill and serve directly from to foil pouch. Dustin Boyer has worked as a bartender, brewer, and restaurant manager. He is the go-to guy for Sun King’s many bar and restaurant accounts and is responsible for booking the food and music for the brewery’s tappings. When he’s not doing that he can be found on a fork lift or making magic with meat on the Big Green Egg. Don’t ask him when he’s opening a restaurant because he only cooks for fun. Party with Sun King In The Local Underground Tent! Join Sun King for an 11-day tent party leading up to and including Super Bowl Sunday! Starting on January 26, the Local Underground Tent will occupy the south parking lot at Sun King Brewing Co., 135 N. College Ave. The 40’ by 100’ structure will be temperature controlled, furnished, and will feature a Sun King beer bar, Santa Julia wine, food by Chef JJ’s Big Green Bistro, and live music from Indy’s best bands Thursday through Saturday nights each week. There will be limited 30-minute parking for Tasting Room customers during this time. If you’re coming to the Local Underground we recommend that you use public transportation or find alternative parking options in the area. Parking is available two blocks from Sun King in a four-story parking structure located at the intersection of Market and New Jersey streets – there are numerous surface lots in the area which may be available for paid parking.IndyGo will provide free transportation to and from downtown during Super Bowl weekend and the Super Bowl Host Committee will provide free circulator shuttles between the Clean Zone, City Market, Fletcher Place, Fountain Square, Sun King, and Mass Ave.
Sun King would like to thank Local Underground sponsors Big Green Bistro, Santa Julia Argentina, Nuvo, 92.3 WTTS, Donate Life Indiana, Kolman Dental, The Naked Monkey,IndyMojo and Lodge Design. Whether you’re a native Hoosier or you’re just in town for an event (Super Bowl, March Madness, motorsports, B1G Ten Championship, GenCon – we host a lot of big parties here), if you like Fresh•Local•Beer and own a smartphone, Sun King has an app for you! • A complete anthology of Sun King Brewing Co.’s house, specialty, seasonal and retired beers. • Valuable information about each beer including style, color, ABV, IBU, tasting notes, and availability. 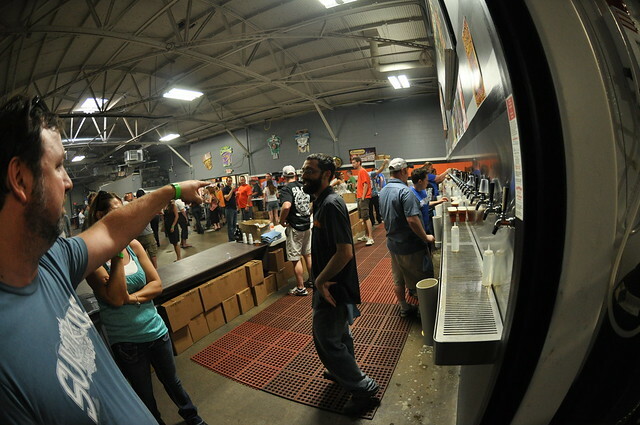 • An up-to-date list of Sun King events at the brewery and around central Indiana. • Contact information, hours of operation, links to Sun King’s website and Facebook, and Twitter profiles. The Sun King App is available for free from the iTunes Store and the Android Marketplace. Marian University Wins 2012 USA Cycling Cyclocross National Championship! Marian University’s cycling team has an impressive collection of national championships – 17 to be exact – but on Sunday the Knights’ added their first CX championship to the trophy case with a win at the USA Cycling Cyclocross National Championship in Madison, Wisconsin. Five female riders placed in the top 12 on Saturday, including race winner Kaitlin Antonneau, pictured above. On Sunday the men sewed up the team championship with four riders placing in the top 12. Read more about Marian’s win here! Sun King is a proud supporter of Marian University Cycling and their efforts to revitalize theCycloplex at Lake Sullivan. This hearty soup is a good way to ward off the winter chill, especially if you’re out tailgating in early February. If a certain team from the Land of 10,000 Lakes make it to Super Bowl XLVI you can substitute your favorite Wisconsin cheddar and make this the centerpiece of your party table. In a 5-8 QT stockpot heat the vegetable oil over medium-high heat, 1-2 minutes, until shimmering, add the bacon and cook until crispy. Remove bacon to paper towels and let drain. Add onion to rendered bacon fat and sauté until soft and translucent. Once onion is translucent add carrot, celery, peppers, and garlic cook until soft, about 4-6 minutes. Stir in flour and cook for 2 minutes. Add the beer and blend with an immersion blender until smooth. Add potatoes, chicken stock, heavy cream, milk, vinegar, Worcestershire, both cheeses, spices, and rosemary, bring to a boil then reduce to a simmer. Simmer over low heat until potatoes are fork tender, about 30-45 minutes. Season with salt & pepper to taste. Top with crispy bacon bits to serve. Serves 4-6 people, pair with Wee Mac Scottish Ale or your favorite malty beer. Sun King’s special relationship with the Harrison Center for the Arts with “East Side Story,” a celebration of all things ease side. A collection of Susan Hodgin’s recent work – …dreamed and not perceived – will be shown in the Harrison Gallery, the work of more than 20 east side artists will be shown in the Gallery Annex and City Gallery, Gallery No. 2 will host “Arsenal Tech Retrospective,” work of Arsenal Tech students and teachers, 1912-2012 and “Outside the Printed Image” will be hung in Hank & Dolly’s Gallery. Sun King products will be available for purchase outside of Gallery No. 2 by adults of legal drinking and a portion of the proceeds will go to support the Harrison Center for the Arts. It's Blog, It's Blog. It's Better Than Bad, It's Good. Sun King has been using online tools to tell our story since before we installed our first brewhouse during the spring 2009. We’ve made status updates on Facebook and Tweeted quite a bit, but due to our rapid and continual growth we’ve never had the time, or the interest really, in blogging. Heading into our third year of crafting Fresh•Local•Beer we’ve found that the sheer number of local organizations we’re partners with, the number of events we participate in, and the stories that we want to share with you really necessitate the use of more than 140 characters at a time. So, welcome to the Sun King blog. There will be posts previewing and reviewing events, though you’ll still get a lot of information about Sun King from our friends in the news and beer media. We will be posting interviews with members of our continuously growing staff, so that you can gain a better understanding of the brewing process and the people behind it. There will educational posts about Sun King beers and beer in general, plus recipes and tips for cooking with Sun King, as well as pairing food with beer. Much like our line up of beers, our hope is that the Sun King blog will have something that everyone can enjoy, from the craft beer novice to the die-hard beer geek.